A new thinner, more powerful Switch with wireless Bluetooth connection? Hell yes! The Nintendo Switch has been a phenomenal success story for the Japanese game meister over the last 16 months, blowing critics and gamers away with its slick hardware and impressive array of great Nintendo Switch games. Indeed, the Nintendo Switch has been so popular that it now holds the record for the fastest selling video game console of all time. However, it looks like the first Nintendo Switch 2 rumours and leaks are now sluicing out, and – just as with Sony's PS5 – the next Switch could be launching much sooner than everyone in the industry thought. That's because Nintendo's most bullish, flag-waving Wall Street analyst Atul Goyal has dramatically slashed his forecast for the Big N's stock price, a move that foretells slowing Nintendo Switch sales. "Market expectations for Switch, as reflected in stock price, have turned from robust growth to no-growth in a matter of three months," stated Goyal, before adding that he felt that the "short-term market is right about Nintendo (for a change) and perhaps it doesn’t grow in hardware sales." Now, this is interesting, especially in light of the fact that Nintendo has been long-rumoured to be launching a smaller, streamlined Nintendo Switch Mini in 2019. If sales of the Nintendo Switch are "ex- growth", as Goyal's report suggests, a term used to describe slowing and potentially flat-lining growth, then the Big N could be forced to launch the Nintendo Switch 2 follow-up system sooner than planned. This move would not only renew excitement among gamers for the portable gaming platform, but also keep its famously bearish investors off its back, too. Few details have emerged so far about exactly what the next Nintendo Switch console is going to be called, or how it is going to be specced. However, rumours of a smaller, streamlined system packing wireless Bluetooth functionality for gaming headsets and peripherals, as well as an internal hardware and screen bump have been proliferating for months. 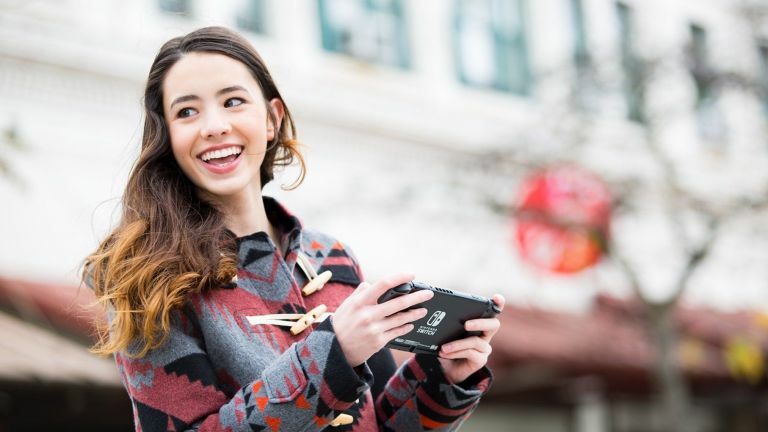 One thing is for sure, though, it feels a long time ago that games like Super Mario Odyssey and The Legend of Zelda: Breath of the Wild were rewriting the rule book and showing gamers just how much they absolutely needed a Nintendo Switch console. Sure, there are still good titles coming out on the system, such as Wolfenstein II: The New Colossus, however there is no escaping the fact that the flow of great exclusive AAA games has dried up significantly in 2018, so Nintendo could help reinvigorate the platform with a hot new piece of technology that really reminds gamers of just why they fell in love with the Switch in the first place. A lighter, slimmer, and more powerful Nintendo Switch with some much-wanted new connectivity features? We'd love it.